One of the foremost voices in food activism and justice, Bryant Terry brings soul food back to its roots with plant-based, farm-to-table, real food recipes that leave out heavy salt and refined sugar, "bad" fats, and unhealthy cooking techniques, and leave in the down-home flavor. Vegan Soul Kitchen recipes use fresh, whole, healthy ingredients and cooking methods with a focus on local, seasonal, sustainably raised food. 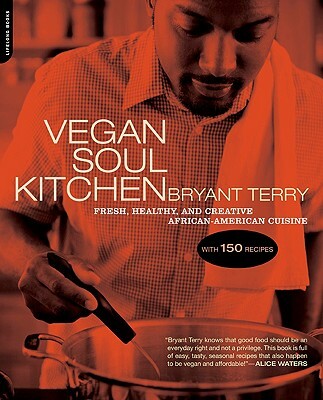 Bryant developed these vegan recipes through the prism of the African Diaspora-cutting, pasting, reworking, and remixing African, Caribbean, African-American, Native American, and European staples, cooking techniques, and distinctive dishes to create something familiar, comforting, and deliciously unique. Reinterpreting popular dishes from African and Caribbean countries as well as his favorite childhood dishes, Named one of the best vegetarian/vegan cookbooks of the last 25 years by Cooking Light Magazine, Vegan Soul Kitchen reinvents African-American and Southern cuisine--capitalizing on the complex flavors of the tradition, without the animal products. With recipes for: Double Mustard Greens & Roasted Yam Soup; Cajun-Creole-Spiced Tempeh Pieces with Creamy Grits; Caramelized Grapefruit, Avocado, and Watercress Salad with Grapefruit Vinaigrette; and Sweet Cornmeal-Coconut Butter Drop Biscuits and many more. Bryant Terry is a chef, educator, and author renowned for his activism to create a healthy, just, and sustainable food system. The coauthor, with Anna Lappe, of Grub, Bryant is also the author of The Inspired Vegan. His work has been featured in The New York Times, Food and Wine, Gourmet, Sunset, O: The Oprah Magazine, Essence, Yoga Journal, and Vegetarian Times among many other publications. As an exclusive speaker signed with the Lavin Agency, Bryant presents frequently around the country as a keynote speaker at community events and colleges, including Brown, Columbia, NYU, Smith, Stanford, and Yale. Currently in his third year as the Museum of African Diaspora (MoAD) Chef-in-Residence, he lives in Oakland, California, with his family. people's hearts is through their stomachs." us for generations to come." celebration that comes from eating this way." book for anyone who wants to eat well." resist the audacity of okra or the soft power of tofu, Vegan Soul Kitchen is the new manifesto that cries out, Yes We Can give up meat and enjoy gastronomic nirvana." "There's no going wrong with Bryant Terry's bible for anyone wanting to cook in the rich southern tradition sans animal (and cholesterol)."